An MMO for kids that doesnt patronise. Accessible, sometimes repetitive, but with enough adventure to hold interest. What is it My First MMO, also appropriate for adults. Influenced by Other Lego games, actual Lego. Right now in Lego Minifigures Online, I'm in outer space fighting aliens with my Paleontologist, Galaxy Trooper, and Little Red Riding Hood... I mean, 'Grandma Visitor'. The resilient Paleontologist 'defender' is my favourite with her special attack that sends out a trio of mini dinosaurs, but the Galaxy Trooper’s guns do more damage. As for the Grandma Visitor, well, she's my 'builder', occasionally useful if I need to quickly fix some cannons or a health pod. Mostly I like that her special move is to ride a wolf. This is no TT Games adventure set in another franchise’s world. The hub world, 'Lego Centre', is a shop with shelves of shiny packets. The themed environments look more realistically made from actual Lego, with recognisable models. The focus, and the best thing about the game, is the minifigures. Each has basic stats (power, health, speed, etc.) that you can upgrade with the stars you get from destroying enemies and scenery. Characters have only only two moves: one on left-click, and a special one—often with a cooldown timer—on right-click. This might seem simplistic to MMO veterans, but there’s variety between the minifigures. It also means you can play with just the mouse, which can be fiddly but is accessible. It’s an admirable attempt to enable kids to safely enjoy an MMO experience. Lego Minifigures Online is openly aimed at children. When you sign up for an account it asks for a parent’s email address. It’s KidSafe certified and in-game chat is monitored by Crisp Thinking, which filters out offensive or age-inappropriate language. It’s an admirable attempt to enable kids to safely enjoy that MMO experience and team up with friends or strangers. It is buggy, though. As well as occasional juddering, the Space World refused to acknowledge that I’d already completed the Medieval World; my paleontologist was suddenly unable to attack until I switched her out and in again; one time I couldn’t switch characters at all; and a boss battle had me and other players repeating our actions with no indication of how to progress. In the latter case I was told only one instance was broken, but the team solved the problem by removing the battle entirely. The story is also child-friendly, but the writers have still put in some effort: the Jester in the Medieval World speaks in rhyme, and there’s a cute attempt to avoid offence by calling enemies in the Pirate World 'Jackets' instead of Redcoats. The story is mainly an excuse to propel you in a linear path through combat encounters. You may be told to 'find out what’s going on before they realise we’re here', or to complete pirate trials to become a pirate captain, but your actual task is usually to defeat enemy after enemy until the quest bar is filled. Combat is repetitive enough that I sometimes got caught out when more interesting challenges arose, like enemies with area effects that reduce your power. More often, I found myself holding down left-click with unfocused eyes. The variety of minifigures helps, but there’s little challenge. You can’t move and attack at the same time, so it’s a hassle even to dodge. I tended to just let my characters take the hits; they were usually able to defeat their enemies before falling themselves, and when they weren’t I just used potions or swapped to a different minifigure. Optional side quests ask you to clear an area within a time limit or collect things—apples, crystals, alien DNA samples—by smashing up the scenery. Mini dungeons called Pocket Adventures are short—appropriate for kids’ attention spans—but with different enough scenery to feel like a break, and they reward you with minifigures and minifigure parts. Dungeons also give an advantage to minifigures of a particular element, which is a simple but effective way to get players to change up their party. The main story is surprisingly long, and there’s an endgame of 'endless' increasingly difficult randomly generated dungeons called the Lost Creations. There are also achievements for unimaginative goals: defeat x mini-boss, destroy y many things as z minifigure, and so on. But the real motivation is collecting those minifigures. While you get some through the story as NPCs join you, others are rewards for the Pocket Adventures and Lost Creations. 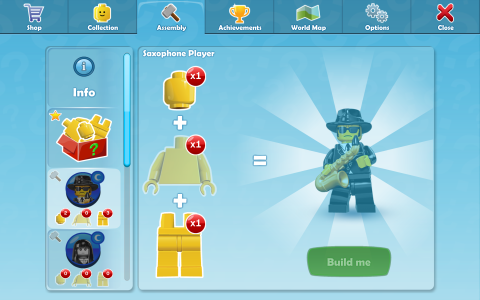 You can also use codes from real minifigures to add them to your in-game roster—at extra cost, obviously. It might seem counterintuitive for a game to go from free to paid, but there’s plenty here to justify the price. It’s buggy, but hopefully that’ll be fixed as more players join. It’s simple, but it is for kids. It’s repetitive, but what MMO isn’t? It’s hardly ground-breaking, but it’s a decent introduction to the genre, a My First MMO with charm enough for kids and adult fans alike.